From the Account screen, you can change your credit card details and change your billing contact. Only full account administrators can update billing information. For security reasons, we cannot take credit card information over the phone or through email. However, you can update your credit card details and billing contact information yourself online. Only full account administrators can modify the credit card details for an account. From the Account screen, click the Update credit card button. The credit card information will be updated, and a confirmation message will be displayed. No charges will be made until your next billing date. If your organization has a dedicated billing contact, you can add his/her contact information to the account. This way, all billing related notifications will be addressed directly to them. Only full account administrators can modify the billing contact, and only full account administrators have the authority to modify the account, regardless of who the billing contact is. 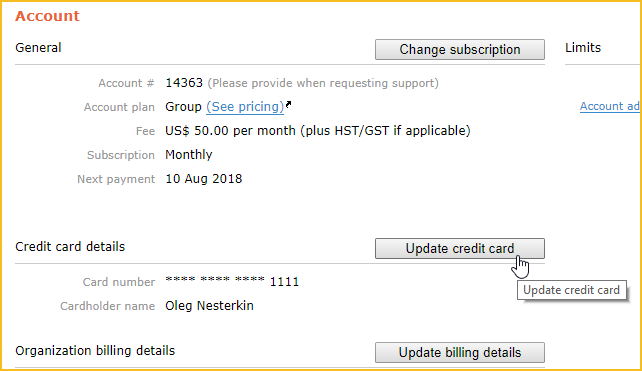 From the Account screen, click the Update billing details button. Update the contact information for your billing contact, then click Continue. Make any necessary changes to the credit card details for billing.